Sherri is currently working on a really cool photo inspired project, titled "Church Wood - Series 2". Painted wood siding that was stripped off an old church and thrown in a pile to burn was the inspiration for this collection. This series will display 4 different patterns; stripes, funnel, stripes/border and criss-cross. No two are a like! 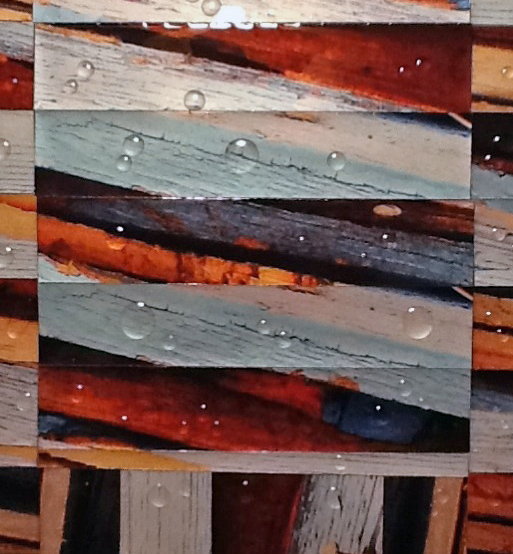 Cut photograph strips are carefully placed in position on a hard substrate, then glued and preserved with epoxy. Water-like epoxy droplets are added for interest. Once the piece is cured, it can be matted and framed for completion. This series is a MUST SEE!...The colors are so vibrant when viewed in person and look almost pearlized. Not all photo paper is the same. Using the right kind of paper can make all the difference in printing, displaying, and preserving photo based artwork - so for this series, nothing but metallic paper would do! There is no limitation to size - so a pattern can be used to fit your specific space. Email sherriannrussell@gmail.com for more information - pricing runs $100 and up depending on size needed.